Is Netanyahu borrowing Modi's 'Mai bhi chowkidar' campaign for his re-election in Israel? New Delhi: There's a parallel between the images both the Prime Ministers of India and Israel have been projecting in their run-up to seeking re-election. Narendra Modi's 'Mai bhi Chowkidar' campaign was a move to blunt the opposition's allegation of alleged corruption in the multi-crore Rafale deal. Benjamin Netanyahu, thousands of kilometres away too has been projecting an image of 'Mr. Security' during his campaign. Israel votes on Tuesday. Thirteen years and 27 days after coming to power for the first time, Netanyahu has always projected an image of a macho nationalistic, ultra sensitivity towards the internal security needs of the Israelis. This move is much like his Indian counterpart 'Chowkidar' Narendra Modi who talks tough on securing borders to keeping corruption at arm's length. Jerusalem Post writes, "Part of it has to do with his success in projecting himself as Mr Security, as a leader who knows how to bring down terrorism, while at the same time not being a military adventurer". The daily elaborates, "Here is a leader who – he has shown – not only can stand eye-to-eye with the world’s leaders – from former US president Barack Obama to Trump, to Russian President Vladimir Putin and German Chancellor Angela Merkel – but who can also articulate Israel’s position on the world stage better than any Israeli since Abba Eban". This statement strikes as being very similar to Modi's campaign where he mentions 'Indias stature at International level' over and over again. Netanyahu too is so obsessed with his own 'chowkidar' image back home, that he hasn't thought twice of calling his opponent a 'security risk'. 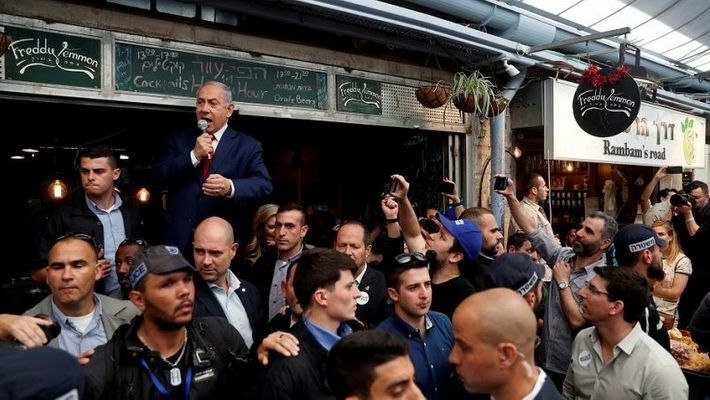 Haaterz.com reports, "Gantz has attacked Netanyahu ...his campaign hoped would turn the tide against Netanyahu and his “Mr Security” image. Netanyahu seized the opportunity of Gantz’s cellphone hacking to insinuate that Gantz is no less than a security risk-prone to Iranian blackmail." At a time when Israel and India have been witnessing growing proximity, and Netanyahu and Modi's personal bonding, this parallel doesn't surprise many. Both of them think the same way, lead the same way. And if Netanyahu is re-elected to power, who knows he may tweet in Hindi too to and say, "Mai bhi Chowkidar." Ousted Sri Lanka PM Ranil Wickremesinghe voted back to power: Who is this close friend of Modi?